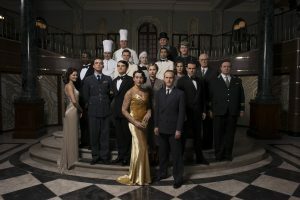 Set in the 1940s, ITV’s The Halcyon charts the lives of staff and guests in a five-star hotel during World War II. The story is told from the point of view of Joe O’Hara (Matt Ryan), an American journalist and illustrates how the war permeated all areas of London life; be it that of the guests seeking an escape from the war or the forbidden love affair of the hotel’s resident jazz singer, Betsy (Kara Tointon). Samuel Sim’s soundtrack punctuates the action with sultry jazz tunes, and will be released the day the show airs. The Halcyon brings together an incredible ensemble cast, including Kara Tointon (Eastenders, The Sound of Music Live! ), Alex Jennings (The Queen, Babel) and Olivia Williams (The Sixth Sense, An Education), Steven Mackintosh (Stan Lee’s Lucky Man, Lock Stock and Two Smoking Barrels), Sope Dirisu (Undercover, Humans) and Matt Ryan (Constantine, Criminal Minds: Suspect Behaviour). Exterior scenes of bombed London streets were shot at The Ropery and on Anchor Wharf, at The Historic Dockyard Chatham in Kent. Set over 80 acres in the Medway area of Kent, The Historic Dockyard Chatham has more than 100 Georgian and Victorian buildings as well as cobbled streets and dock spaces. The Historic Dockyard Chatham has previously welcomed filming from The Crown (2016), Partners in Crime (2015) and Sherlock Holmes: Game of Shadows (2011). This entry was posted in Filmed in Kent and tagged Kara Tointon, The Halcyon film locations, The Historic Dockyard Chatham, TV Drama. Bookmark the permalink.